Master Blasters is an introductory-level modified game of cricket aimed at girls and boys aged seven to nine, who haven't played organised cricket before (but may have done the previous MILO in2CRICKET). All games will be played at the South Brisbane District Cricket Club, Venner Road, Fairfield. Children will be placed in a team of eight (we have mixed and girls-only teams). Everyone has a turn at batting, bowling and fielding. The program is run by club volunteers and parent participation and assistance will be required. Master Blasters runs for eight weeks on Friday afternoons from 4.30 to 6.00 pm. Registered participants receive a Master Blasters pack, which contains a hat to wear. Otherwise, school uniform or club or other cricket shirts may be worn. A hat, covered shoes and a water bottle are essential. All equipment for the program is provided by the club. Visit our registration page for information on fees for 2018-19 season and to find out how to join the Master Blasters program at Souths. If Master Blasters needs to be cancelled because of wet weather, a notification will be published on the home page of this website on the afternoon of the games. In the event of wet weather, there will be no make-up games. 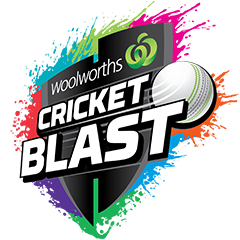 For further information about Master Blasters, visit Cricket Australia's Master Blasters website.